We maintain a growing and open dataset of boundaries and regulations that apply to marine protected areas (MPAs) and fishery management areas in U.S. and international marine waters. The goal of our effort is to provide a helpful resource for fishermen and mariners to use on the water and to enhance situational awareness of regulations and conservation measures for long-term marine management. Our U.S. contribution is depicted in this chart, but we could not do it alone. A large portion of boundary data in our datasets is compiled from federal and state agencies that created the data for marine managed areas under their jurisdiction. 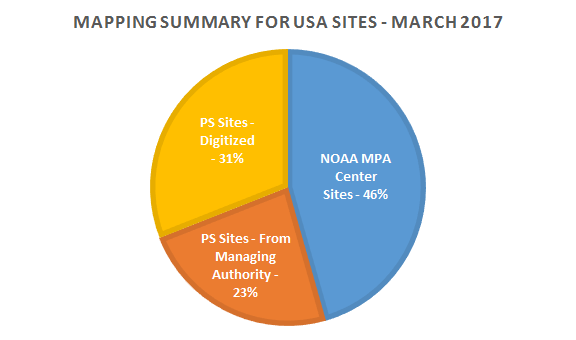 We are pleased to be in a public/private partnership with NOAA's National MPA Center. This partnership has helped ensure the most comprehensive and accessible MPA data is available for marine resource managers and the general public. We are also proudly partnered with Navionics to assist boaters and fishermen with navigation in and around Marine Protected Areas. We are continually seeking additional contributors and partners to expand the dataset and make it more robust. If you have marine managed areas that you would like included in our datasets, please see our Submit Data page for instructions on how to contribute. Or, if you would like to distribute this data or if you have feedback about existing data, please contact support@protectedseas.net. NEW! Our U.S. marine managed area dataset and related apps and web maps are now available through ArcGIS Online here, making them more accessible to conservation organizations and agencies. The database that supports this application is updated regularly with new boundaries, boundary modifications, updates to regulations and other information obtained through feedback provided from users. Changes made between versions are recorded and published with the downloadable data. If you notice errors for an area, please let us know by sending us a message here! ProtectedSeas is working to map all global areas - but it's a big task! If you have MPA data you would like to share, please send us a message via our Contact Form.